Four of the six second-generation Globalstar mobile communications satellites launched in October are ready for service, and the company plans to send six more spacecraft into orbit in May. Globalstar is launching 24 fresh satellites to rejuvenate the company's aging satellite constellation and restore global two-way voice and duplex data communications service, which has been limited by S-band antenna degradation since 2007. The spacecraft are launching six at a time on four Soyuz rockets from the Baikonur Cosmodrome in Kazakhstan. The first set of satellites blasted off Oct. 19 and were successfully released in a 571-mile-high orbit. Each spacecraft then fires its thrusters to raise its orbit to an altitude of 878 miles, the operational perch of Globalstar's existing satellites. The satellite fleet is spread through eight orbital planes to maximize their communications coverage around the world. Four of the six new satellites are already in their permanent orbital locations and ready for service, according to Thales Alenia Space, the spacecraft contractor. "All four of these satellites have now passed acceptance tests, with both payload and platform showing very satisfactory performance," Thales said in a statement Monday. "Furthermore, the quality of the initial calls transmitted by these satellites is excellent." The other two satellites launched in October are still in a transition orbit, according to Thales. 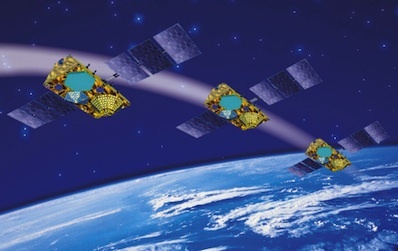 Globalstar's 40 existing satellites were mostly launched between 1998 and 2000, and officials plan to remove the older craft from the company's fleet as new vehicles enter service. The second-generation craft are designed to work for up to 15 years, giving Globalstar continuity of service through 2025. The company expects to launch six more satellites in May, followed by two more launches two or three months later, officials announced Feb. 9. "As planned, during the orbit-raising of the first new satellites launched in October, we continue to validate our on-orbit acceptance tests and operating procedures for each of the new spacecraft," said Tony Navarra, president of global operations for Globalstar Inc. of Covington, La. "Our six-month validation period is being used to confirm our satellite design and performance. Once complete, and barring any unforeseen issues, we will be able to confirm a more specific scheduled launch date." Navarra said in October that Globalstar customers should see gradual communications improvement as each new satellite is introduced into the operational fleet. Globalstar plans to integrate the 24 fresh spacecraft with the eight newest first-generation satellites to form a constellation of 32 operational platforms. The company invested $1 billion in the development and launch of the new satellites.